These days, you have many choices of how to buy your insurance. For example, insurance television commercials advertise 1-800 numbers and tout how easy their coverage is to buy. What they don’t tell you is whether it’s the right choice for you. Buying your insurance through a 1-800 number will get your insurance quickly, and it might even get it cheaply. But it may not be the best coverage for you, and chances are you’ll never speak to the customer service rep who sold you the coverage again. Do you have a problem with your insurance? You’ll probably be speaking to someone else. Have a question about whether to file a claim? Prepare to talk to a third person. In fact, you’ll probably talk to a different person every time you call. On the other hand, a local agent can provide the personalized service you can’t receive from a 1-800 number on TV. Local agents are members of your community who will meet with you and develop a relationship so that they have a better idea for your unique, ongoing insurance needs. However, some local agents work for only one insurer. These agents may say they provide the best possible coverage, but that will only be the best option from their one and only company. As a result, you can never be sure that they are truly giving you the best coverage, or best price, available in the industry. A local independent agent can take the time to provide the individualized service you can’t receive with a 1-800-number on a commercial. They can also provide a range of choices that a local agent bound to one insurance company simply can’t. An independent, local agent takes time to discuss your needs, and the things that are important to you, then offers the best coverage to you from a whole host of companies. 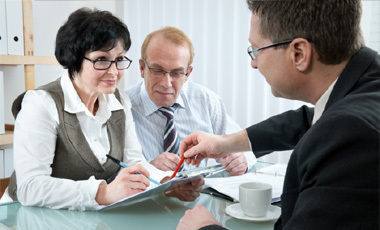 Beyond that, a local agent develops a long-term business relationship with you and your family. Whenever you have a question about changes in coverage, you can simply call your local independent agent and know that you’re receiving prudent advice. And when a mishap strikes, and you need someone you can trust, your local agent is nearby to help. In short, a local independent insurance agent can provide a “best quote” nearly as quickly as a 1-800 number representative, but that “best quote” will truly be the best available from many companies, and your relationship with your independent agent will last years longer. At ICM, we’re not just any independent agency. Our agents have decades of combined experience assisting customers like you, and we offer insurance from more than a dozen carriers. That means that we can choose from a variety of plans to tailor the excellent coverage for you and your family. As a member of the Big I of Wisconsin, the state’s premier association of trusted independent agents, we are committed to providing the best service for all of your changing insurance needs. It’s that service that will forge a relationship so that you know you can depend on us whenever you need us. The Insurance Center of Milwaukee, Your Local, Independent Insurance Agency—Call us today. Offers the best insurance options from more than a dozen top carriers, including coverage for autos, homes, and more. Provides attentive personalized service and advice on all of your insurance needs. Is a member of the Big I of Wisconsin, and is a "Trusted Choice" among independent agencies. Is conveniently located and can meet with you at our office or your location in the Milwaukee area.